Contemporary pop culture has always served as a sort of lens for my experiences. Much as the mythology of ages past has helped humanity understand and define the world around it, so the cartoons, television shows and movies of my childhood have served to afford me a measure of security and order. My paintings express this through my use of pop culture iconography as archetypal representations of a thought, a theory, or a belief. I am attracted to things that evoke memories from childhood, a time when contrasts are at their most potent. Good/bad, right/wrong. In childhood there is little room for the grey areas that become more apparent with age. I feel nostalgic for this and yet I see the danger in the extremes and feel I must poke fun at them. Cartoon superheros were the ultimate “good guys”. We were supposed to believe that they always did what was right, without questioning their motivation. Never a dark thought, never faltering, These characters were the impossible, unreachable measure of good people, a ludicrous example of how people “should” be. As an unreachable goal they doomed us all to failure and self-loathing and therefore must be exposed and ridiculed. I also like the play with the idea of that old saying, “show me the boy at seven and I’ll show you the man”, that we become what we are by seven and constantly return to that basic persona even as our world changes around us. Aside from my paintings I regularly dress in a bear suit of my own making and use it to interact with the world in an attempt to brighten the mundane and challenge perceptions. All images and characters the property of the site manager. 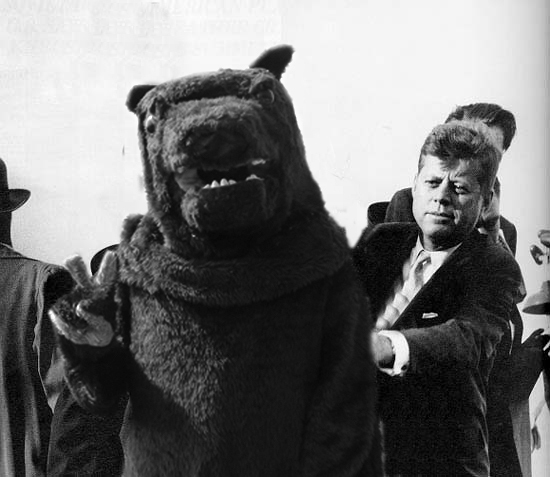 Filthy the Bear and JFK, November 21st 1963. Photo courtesy of the Smithsonian archives.